Chronic pain doesn’t just hurt – it can be debilitating, frustrating, and can impact daily activities such as walking, cooking, dressing, bathing etc. It can further lead to other concerns such as insomnia, fatigue, depression and anxiety. Even though you may have had arthritis for years, you don't have to live with the pain. 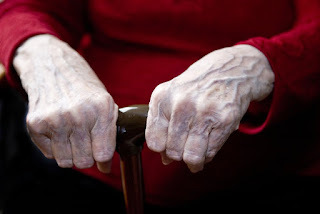 Arthritis pain, even in seniors, generally responds very well to simple changes in diet and gentle exercise. There are also a number of naturopathic treatments that can reduce the pain, without causing side-effects. If you are dealing with arthritis, I encourage you to try the steps below to reduce your pain and to regain better movement of your joints. As a foundation, anyone with arthritis should be taking natural anti-inflammatories and supplements for joint support. Most anti-inflammatories work in the same way as prescription medication and are natural without causing major side effects. For example, Boswelia is a herb that is very effective in reducing pain, and fish oil is widely accepted for it's ability to reduce inflammation in the joints. It is important to speak with your naturopathic doctor to choose the right supplements for you to ensure the dosage and quality is effective for your condition, and to ensure that there are no interactions with other medications you may be on. In addition to supplementation, below are tips you can do on your own to relieve arthritis. Customized supplements and herbs will speed up healing and give your body the building blocks to rebuild joint tissue and reduce inflammation. However, even if you are taking the best supplements, if you are not eating a supportive diet, your arthritis may not improve as well as it could. Avoid: foods that cause inflammation; sugar, artificial sweeteners, deep fried foods, refined flour, additives, red meat and alcohol. Different foods can cause different reactions in each person. To personalize your diet and identify the foods that you are sensitive to, your naturopathic doctor can run a simple food intolerance test. If you are struggling with cravings or making changes to your diet, your naturopathic doctor can guide you on how to include anti-inflammatory foods into your diet while enjoying your meals. Include: a diet that is suited to your constitution and condition. Bone broth soups can easily be made at home and provide minerals and nutrients to nourish your joints. Anti-inflammatory foods can be included into your meals such as ginger, turmeric and leafy greens. It may be difficult to move if there is significant pain, but gentle exercises can help you decrease pain, increase range of motion and flexibility, strengthen muscles, improve circulation and help you feel uplifted. It is important to discuss with your naturopathic doctor to choose the right kind of exercise for you. Avoid: pushing yourself to exercise or doing repetitive movements which can strain the joints. Listen to your body and don't push beyond what is comfortable. Include: gentle exercises that improve flexibility and blood flow to the muscle and joints. Restorative yoga, tai chi, walking and water exercises are examples of low-impact exercise that you can include into your day. For example, simple hand stretches (opening and closing your fists) can be done a few times a day to increase joint mobility. Knee curls don't require any special equipment and can improve flexibility in the knee joint. To do this, you support your hands on the back of a chair while standing and bend one leg at a time. Depending on the severity of your arthritis, doing even 10 minutes of gentle exercise twice a day can result in significant improvement in joint health. Ayurveda & Traditional Chinese Medicine are systems of medicine which evaluate the presence of hot (yang) or cold (yin), in the body. The eastern systems of medicine examine the causes and manifestations of joint issues and treat accordingly with the opposite quality. If your joints are warm and inflamed, cold treatments are recommended. If your joints are painful and stiff due to cold weather, warm treatments are recommended. Avoid: cold weather or cold treatments on arthritis that is worse with cold. Avoid excessive heat on arthritis that is worse with warm weather or is inflamed. Speak to your naturopathic doctor who can guide you on what kind of arthritis you have and what is the best way to manage it. Include: warm baths for arthritis that is worse with cold weather. If you have difficulty getting into the tub, you can try foot or hand baths, or apply heat packs to affected areas. For arthritis where the joints are inflamed, you may find relief with cool washcloths or topical ointments with cooling ingredients such as menthol. Topical hot or cold packs are simple and effective ways of relieving pain at home. Applying oil to your joints topically can be very effective in lubricating the joints and soothing pain. For example, castor oil can reduce the inflammation in arthritic joints and relieve pain. Warm castor oil can be massaged gently into the affected joints before bed, and wrapped with a cloth and a heating pad for the castor oil to penetrate deeper. Another example is Mahanarayan oil which is a popular Ayurvedic oil that is effective in reducing pain. Avoid: straining yourself by trying to do self-massage. Avoid positions that could put you at risk of falling. If you have difficulty doing self-massage, ask someone to help you or book a massage with a professional for pain relief (such as abhyanga massage). Include: oil suited to your constitution and type of arthritis. Ensure that the oil is not rancid and is a good quality oil (organic is best). The following essential oils can also be added to a base oil (such as castor, olive, sesame oil) for pain relief: boswelia, camphor, ginger, peppermint, myrrh. The frequency of application and the type of oil are best recommended according to your constitution and health condition. Topical treatments don't only include oils, but include other varieties of creams, gels and ointments. Speak to your naturopathic doctor for more personalized guidance. The mind-body connection cannot be overrated. Mood can play a significant role in managing chronic disease, and it’s common for individuals with arthritis to feel frustrated and discouraged by the pain and inability to do daily activities. Depression and anxiety can further increase the experience of pain and decrease your ability to cope. Rather than fighting arthritis, try focussing your attention to nurturing yourself. Self-love and self-care promotes healing in the body, mind and spirit. Knowing that you can get better with self-care treatments and professional guidance can give you strength and hope. Avoid: negative thoughts (“I wish I…I should have…I’m useless) and avoid focussing on what you can’t do. If you find yourself having difficulty coping with chronic pain, speak to your naturopathic doctor. There are many options to help alleviate depression, fatigue, anxiety often associated with chronic disease. Include: meditation and gratitude on a daily basis. Plan activities or events to look forward to: lunch with a friend, a short vacation, outings with family, book clubs, hobby groups etc. Focus on your strengths and what you can do. Individuals who have a positive attitude towards life and look forward to the day are better equipped to cope with illness. Managing chronic pain on your own may not be enough. If you are struggling with arthritis, you are not alone. Talk to your naturopathic doctor who can identify the root cause of your pain and customize treatments to bring relief - even if you are already on medications. There are numerous treatments such as acupuncture, cupping, massages, diet and supplements that are very effective in reducing pain and managing chronic arthritis, but they need to be customized based on your condition, constitution and other factors. Taking the time to do activities that you enjoy, pampering yourself with treatments, taking suitable supplements and eating a diet which replenishes your body are all ways of improving your condition. You don’t have to live with chronic pain. There is hope. Take steps forward to pain-free living today! Dr. Leena Athparia is a naturopathic doctor at Naturopathic Foundations with a focus in chronic pain management related to aging, metabolic issues and chronic disease. She is skilled in pain relief with naturopathic & Ayurvedic treatments. If you are experiencing joint pain, please call the clinic at 905-940-2727 to book an appointment with Dr. Athparia.